Swissporarena is a 2011 built multi-purpose sports stadium located in the north-central Swiss town of Lucerne. 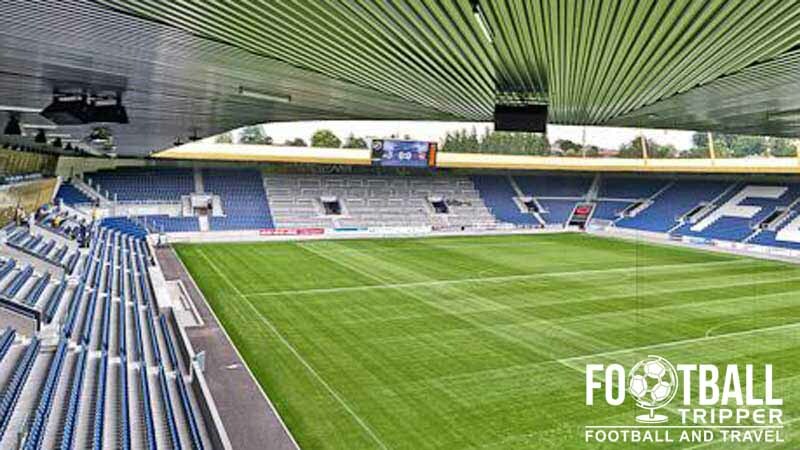 Replacing the demolished Stadion Allmend, the golden exterior of the Swissporarena is now home to local side FC Lucerne, with seating available for just under 17,000 fans. Before moving into the shiny Swissporarena, FC Lucerne played their home matches at Stadion Allmend between 1934 and 2009 but after the Swiss F.A declared large parts of the stadium unsafe, the theoretical capacity was reduced from 25,000 to just under 13,000, and the club began to formulate plans to construct a more modern football ground. Constructed on the site of their old stadium, Lucerne temporarily located to Gersag Stadion in Emmenbrücke for the required two year construction period. 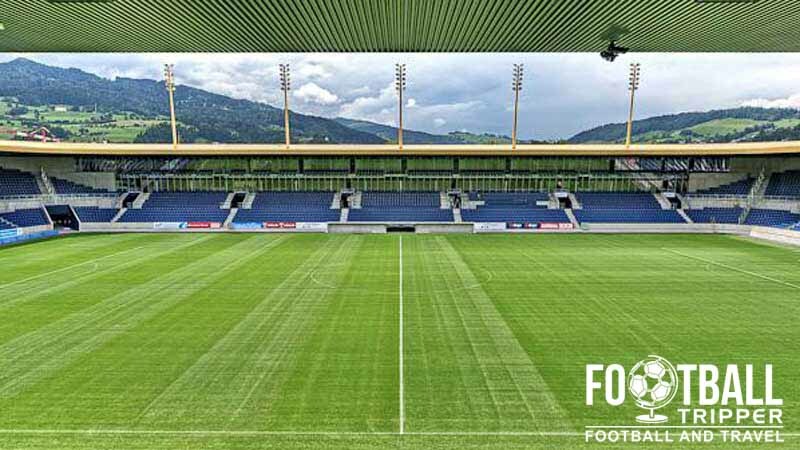 Opened on the 31st July 2011 when an inaugural match was held against FC Thun, the Swissporarena had a smaller 16,800 capacity but with significant reduced maintenance costs and not to mention state of the art matchday facilities for both the players and supporters. The club initial envisioned moving into the stadium during the Spring but after a few construction delays the planned opening ceremony and match against Hamburger SV was held later on in the year on the 3rd of September. Famous for its bright golden exterior, the city of Lucerne boasts one of the most unique stadiums in the world. To date, Swissporarena has hosted four international matches of the Swiss national team including a friendly against Romania, and a qualification game against Albania for the 2014 World Cup. 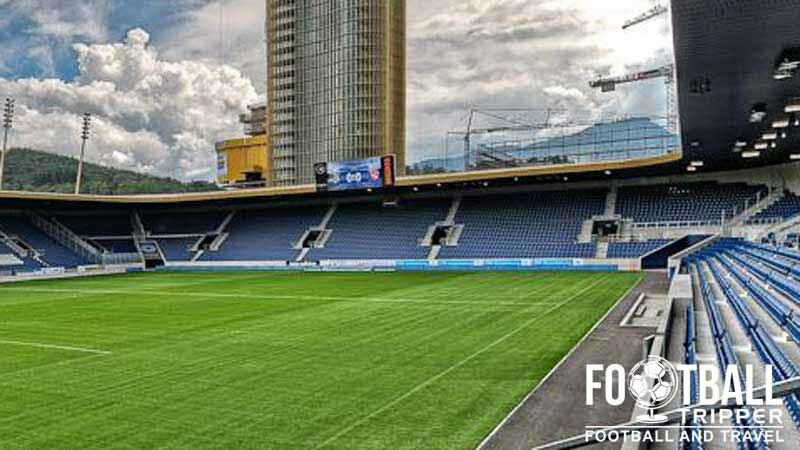 At club level, the highest level of matches held at FC Lucerne’s ground besides are two matches of the Europa League against KRC Genk and Scottish side St. Johnstone. The Swissporarena is comprised of four stands: North, East, South and West. Away fans are housed within the south-east corner of the stadium within seating section C6 which is the greyed out zone on the above seating plan. Entrance is granted through gate DC. 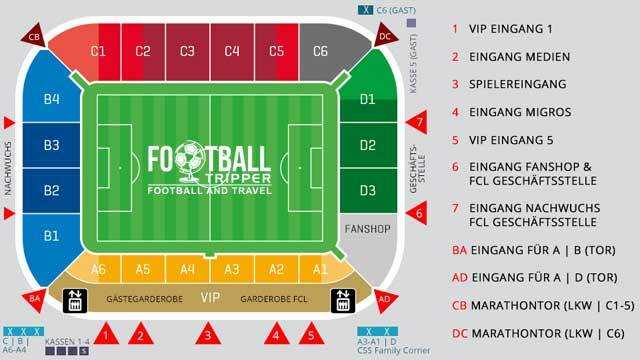 Tickets for the away section cost 25.00 CHF for adults and can only be purchased with cash from ticket office number 5. FC Luzern’s club shop at Swissporarena is located within the western side of the South Stand and with the exception of the online fan shop, is easily the best place to purchase official merchandise of Die Leuchten (The Luminaries). On matchdays the fan shop is open for up to 90 minutes before kick-off for those in possession of a valid matchday ticket, and then again for a short while after the full time whistle. There are a number of stadium tour packages available for those fans looking to gain a behind the scenes look at the Swissporarena however the “standard package” is by far the most popular. Simply known the “Stadium Tour” the standard package is a fully guided tour which lasts 60 minutes, costs 18.00 CHF per person and is suitable for groups of up to 10. You can book your place on the tour by visiting this page and contacting either of the Event Managers via “E-Mail schreiben”. 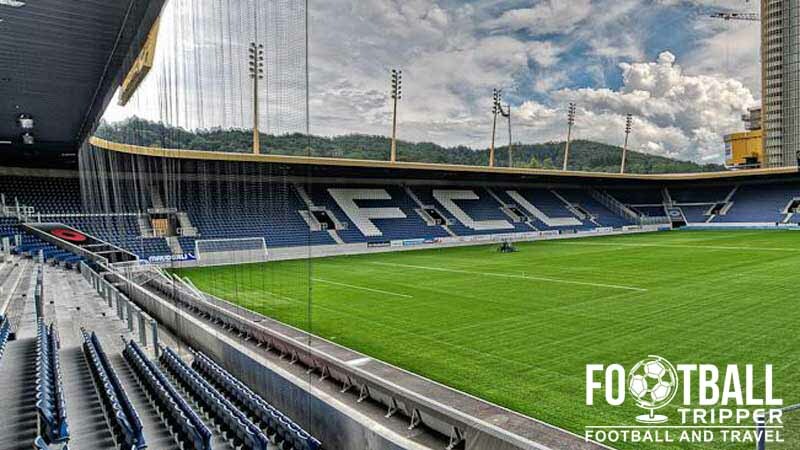 Tickets to see FC Lucerne play at their golden jewellery box of a stadium can either be purchased in advance of the match online or before kick-off from the various mobile box offices dotted around the ground. Swissporarena sits some 2.2 km south of Lucerne city centre which Google basically defines as being the area around the railway station. From here most Football Trippers can easily walk to the ground within the best part of 30 minutes although the public transport options are quick, simple to use and convenient. Located out of town there are at least three car parks at Swissporarena which operate on a first-come first-served basis on matchdays. Parking costs a flat fee of 10.00 CHF for the duration of the match and a few hours either side of this. The stadium is effectively served by its own railway station known as Luzern Allmend/Messe which is 2 minutes north of Swissporarena. You can catch the S4 and S5 commuter overground services from Luzern Station in the city centre which is only one stop away. From Luzern Railway Station in the city centre you can catch bus number 20 from the depot which will take you to Allmend/Messe station, essentially mirroring the train route. More frequent than the train service, the journey takes around 8 minutes in total. The closest international airport to Lucerne is in Zurich at a distance of around 77 km. Upon landing you can either hire a rental car or catch a train service into the city centre. All of your accommodation options lie back within Lucerne’s historical centre with familiar names awaiting you such as Hotel Ibis, Radisson Blu and Best Western. As it’s Switzerland hotels are generally quite expensive although there are one or two relative bargains in the form of the two star Hotel Alpha and the unassuming place known simply as “The B+B”.